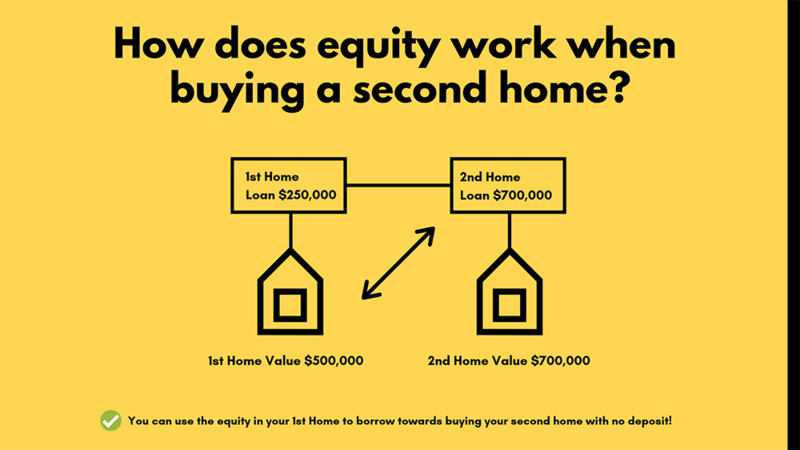 This is the most comprehensive guide on using equity to buy a second property. In this expert-written guide, you’ll learn everything you need to know about buying a second home and renting the first, from using equity to buy a second home to what you need to pay in stamp duty. So if you’re looking to learn how to buy a second property with no deposit, you’ll love this guide. Can you buy a second house and rent the first? How do you rent your old home and keep as an investment? Can we afford a second property? What is the best loan structure? Will the bank refinance the first loan and combine the two? Should I stay with my current lender or refinance? Am I required to pay mortgage insurance? You could be with a partner, thinking about the next stage of your life and wanting to buy a house together. Or maybe you are moving interstate for work and wanting to keep your existing home as an investment property. Whatever the reason, your first home isn’t often your forever home and you will eventually get to a point of upgrading your home. And while you might not have the cash in deposit you have something much more powerful: equity in your home. If you have owned your property for over 5 years you may have gained equity in it. You can tap into this equity to create a bigger deposit for your second property, and increase your overall budget. Karen bought her first home 6 years ago for $305,000 in Brisbane with a loan of $250,000. In the time since Karen bought her home, she met Dave, has fallen pregnant and is now wanting to move into a bigger home, in a better school catchment area. We got her first home valued today at $500,000, and Karen owes $250,000. The awesome news is that Karen now has $250,000 equity in her first home, meaning she can withdraw up to $150,000 in home loan equity. This $150,000 home loan equity can be used as a deposit on her second home. Read More: Equity Calculator: How to Work out Your usable Equity? You might have an existing home and be wondering: Can I use my property to buy a second home? Let’s look at Karen’s example again. If Karen and Dave wanted to buy a second home, and they didn’t own an existing home they would need to have a cash deposit and savings to get the new place. But Karen can get a loan against the $250,000 in equity available against her first home, and put an 80% loan against this to take out $150,000 in new lending. This $150,000 can be used as a deposit to buy a second property! Karen can use the equity in her 1st property, to purchase a 2nd home. If you are wanting to buy a second house, or upgrade your first home you might be wondering: can I rent the first? The good news is, yes you can – let’s look at Karen’s situation again. Karen has found a second home to buy for $700,000. The plan is to keep her first home as an investment property and live in the second home. This is completely fine, and in fact, the banks might use the rental income from your 1st house towards your overall income. It can also give you access to tax strategies like Negative Gearing. There could be tax benefits for renting your old home and keeping it as an investment property. If you want to speak with someone about your situation, give our Home Loan Experts a call on 1300 088 065 or complete an Online Assessment to see what your options are. Read More: How much home can I afford? While it might be possible to buy a second home, looking at how much debt you are about to get yourself in you might be asking: can we afford the 2nd property? ✅ Calculate how much the total repayments will be, versus your total income. ✅ Estimate what your rental expenses might be. ✅ Try to maintain a safety buffer. Estelle is 32 weeks pregnant and has been looking for a new home for her family for the past 8 months. She finally found the perfect home but wasn’t sure if she could qualify for a loan. Her plan was to take 5 months off after the birth of her new baby, then go back to work. Estelle thinks she will have 5 months off work, we suggest having a bit of a buffer to make sure you have enough money put away for a bit extra. So let’s assume 6 months off x $500 shortfall = $3,000 buffer. Either way, if you have a baby try to estimate how much time you’re having off and build a safety buffer for this. Cross Collateralisation is a loan structure most banks will use, it involved using your existing home as security to buy a new property putting both homes under the one mortgage. The downside to cross-collateralisation (also known as cross-collateralization, cross-securitising, or cross collateral mortgage) is it can limit your options in the future. Cross-collateralization can lock you in, and limit your options. For example, if you want to sell your existing home in the future – you will need to revalue your new home at the point, and if the valuation comes in lower you might OWE the bank more money. The upside to cross-collateralisation is that the banks will sometimes give you sharper interest rates. There can be pros and cons to crossing your properties within your structure, either way, we’d suggest speaking with a Mortgage Broker to find out what is best for you. To discuss your situation, contact our Mortgage Brokers on 1300 088 065 or fill in our free online enquiry form to get a callback. You will want to talk to the bank, or your Mortgage Broker about this before you sign any forms. In a cross-collateralised structure, the bank will look at combining both loans and both properties. Let’s look at the cross collateralised example from above. The problem with this structure is if you go to sell your first home down the line, the bank can ask you to get a new bank valuation. A better structure would be like this. The 1st home and 2nd home would be stand-alone secured, meaning you could sell or refinance either and not need to get new valuations. So if the market were to change you’d be protected. While different rates and products, the valuation makes the largest difference. I have seen valuations make and break buying a seance property. For example, with this client we recently helped we managed to get them $130,000 increase in their property valuation by looking at another bank. Assuming an 80% LVR loan, that is $104,000 in additional home loan equity they used towards buying a second home. Yes you could be, depending on the valuation of your first home. If your lending is over 80% LVR you would need to pay lenders mortgage insurance. LMI calculator can work out how much the lenders mortgage insurance will cost. Read More: How much will LMI cost? Remember, every home loan situation is different. If you are looking to buy a home our team at Hunter Galloway can help. Jayden Vecchio and Hunter Galloway are experts at Home Loans. I’m Jayden Vecchio, and our team here at Hunter Galloway helps home buyers with navigating the home buying process. Speak with our mortgage brokers about your options. Call us on 1300 088 065 or complete our free assessment form today.